I’d love to Donna. Bertha-Size Your Life! is a funny, coming of age story for women who already have… a time or two. It’s all about empowering women to be themselves… once they discover who that is. But don’t get me wrong… it’s not a stuffy self-help book. No, far from it! Bertha is quite the character strutting around in her lime-green spandex, tube tops, and stilettos. She jumps on a soapbox at a moment’s notice and still finds time to maintain a perfect pedicure and fight with the cat. Where the Joys Are: Bertha’s Guided Journal is all about finding more joy in your life. It is a series of vignettes and journaling prompts…but the best part to me is the Joy Meter… you get to pick the shoe that best describes your mood. WTJA was the most fun book to write… Bertha is in her wildest outfits and having a blast! Becoming Bertha is in the editing process and is slated for a fall 2014 release. It continues the self-discovery of the first book and has a cool twist and the end. The character Bertha is so lifelike that it’s easy to forget that she isn’t a real person. Do you hear that often? One of Bertha’s favorite sayings is “When life hands you an ostrich… make a boa!” Can you tell us about your boa collection? Oh, I just had to add on a new closet to house all the boas I’ve collected over the years. What I’m learning, with Bertha’s help of course, is to not feel regret, failure, anger, guilt, or any of those emotions when things don’t turn out just exactly as I’d planned. I try to see the experience as helping me to become the person that I want to be. Bertha has some rather, how can I say this delicately, zany antics. Do they come from your life? Unfortunately, some of them do…I have been known to put on my sandals and polish the toenails that were showing when I was in a hurry. And, yes… we rolled our hair on orange juice cans in the day. The actions of the cat… well… I couldn’t make them up… I’m not that creative. (Smile) But mostly the things that Bertha does are outrageous exaggerations of everyday life. What about you, what do you do for fun? I’m supposed to be having fun? Seriously, I love writing and for the most part it is FUN. I have always loved playing with words, twisting them around, putting them in unexpected places. I also love to read, ride my bike, and spend time with family and friends. Do you have a favorite review? I love all my reviews because they give me insight into my readers and how they identify with Bertha. And, yes, there have been a few who didn’t identify with her at all… but it’s good to know that, too. I think the phrase that delighted me the most was in a recent review for Where the Joys Are… “I love this author. I would read her grocery list…” I’m just hopeful that while she is reading it… she’ll pay for them, too! One last question. Will you continue to write about Bertha? I’m pretty sure of it. I think she’s like one of those soap opera characters… that even if I killed her off… she’d come back from the dead in a couple of years! But I can’t see her going anywhere anytime soon. In fact, she’s considering starring in a cozy mystery next year. Who knows where Bertha will show up next? 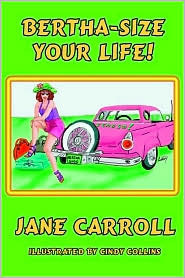 Alabamian Jane Carroll, Author of Bertha-Size Your Life and Where the Joys Are: Bertha’s Guided Journal, is a Life Coach, Registered Nurse, Reiki Master, Mother, Grandmother, and long-time student of life. She has seen the focus of her over 30 year nursing career change from illness to wellness to wholeness, a philosophy that permeates everything she does. Jane gives a face, a wardrobe, and a flare to inspirational humor. Her writing weaves a rich tapestry of humor, inspiration, insight, southern roots, and friendship for readers in the empty nest period of life. While she enjoys all aspects of her life, writing is her passion and she is currently working on Bertha’s latest adventures. Girl Who Reads is an Amazon advertising affiliate; a small fee is earned when purchases are made through the above links. Don't have a Kindle? Get a FREE Kindle Reading App. The views, opinions, and beliefs expressed by guest are their own and do not necessarily reflect those of Girl Who Reads. Thanks for the awesome interview...such an honor to be featured!